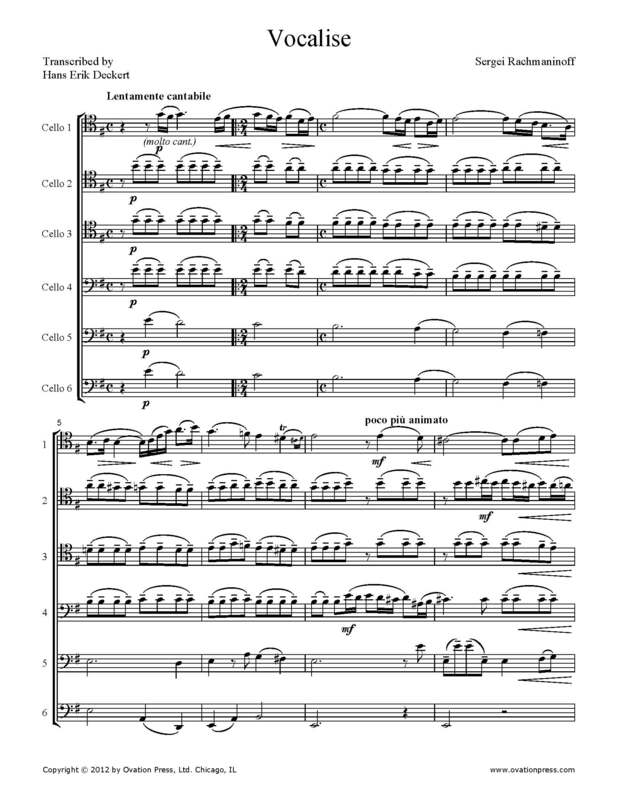 Rachmaninoff's Vocalise has been arranged for cello sextet by German cellist Hans Erik Deckert, a prolific arranger of cello and cello ensemble music. Mr. Deckert engages in freelance work and holds visiting posts at academies throughout Europe. He is also resident conductor with the Cello Academy, which embraces a professional 12-part cello ensemble as part of their student training. Vocalise, Op. 34, No. 14 is a song by Sergei Rachmaninoff, published in 1912 as the last of his Fourteen Songs, Op. 34. Written for voice with piano accompaniment, it contains no words, but is sung using any one vowel. It was dedicated to soprano Antonina Nezhdanova. In this adaptation for six celli the solo part is retained in the first cello, while the piano part is distributed among the other five celli. The rich characteristic harmonic textures of Rachmaninoff’s music is very suitable for a cello ensemble. It is strongly recommended that the first cello part is played by 2 or 3 cellists. Download and print the score today to gain access to this expertly edited arrangement of Rachmaninoff's Vocalise for cello sextet by Hans Erik Deckert!